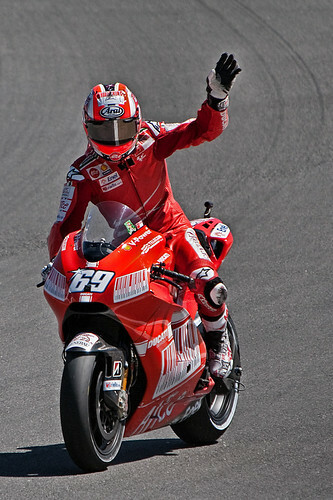 Nicky Hayden, original photography by Joe Ercoli. If you have yet to see the red, white, and blue bike that Nicky was riding in the race at Laguna this year, this would look like any old race to you. But, this is in fact a shot of him as he was finishing the last practice on Saturday and waving to the crowd after coming through the corkscrew. Remember, you can click on the images in each post to take you to the gallery and see the pic in a much larger size. This entry was posted on Saturday, July 18th, 2009 at 9:53 pm	and is filed under Blog, Photos. You can follow any responses to this entry through the RSS 2.0 feed.